Benchley being interviewed about Jaws in "A Look Inside Jaws", produced by Laurent Bouzereau. Peter Bradford Benchley (May 8, 1940 – February 11, 2006) was an American author, screenwriter, and ocean activist. He is known for the bestselling novel Jaws and co-wrote its subsequent film adaptation with Carl Gottlieb. Several more of his works were also adapted for both cinema and television, including The Deep, The Island, Beast, and White Shark. Benchley was the son of Marjorie (née Bradford) and author Nathaniel Benchley and grandson of Algonquin Round Table founder Robert Benchley. His younger brother, Nat Benchley, is a writer and actor. Peter Benchley was an alumnus of the Allen-Stevenson School, Phillips Exeter Academy and Harvard University. After graduating from college in 1961, Benchley travelled around the world for a year. The experience was told in his first book, a travel memoir titled Time and a Ticket, published by Houghton Mifflin in 1964. Following his return to America, Benchley spent six months reserve duty in the Marine Corps, and then became a reporter for The Washington Post. While dining at an inn in Nantucket, Benchley met Winifred "Wendy" Wesson, whom he dated and then married the following year, 1964. By then Benchley was in New York, working as television editor for Newsweek. In 1967 he became a speechwriter in the White House for President Lyndon B. Johnson, and saw the birth of his daughter Tracy. Once Johnson's term ended in 1969, the Benchleys moved out of Washington, and lived in various houses, including an island off Stonington, Connecticut where son Clayton was born in 1969. Benchley wanted to be near New York, and the family eventually got a house at Pennington, New Jersey in 1970. Since his home had no space for an office, Benchley rented a room above a furnace supply company. By 1971, Benchley was doing various freelance jobs in his struggle to support his wife and children. During this period, when Benchley would later declare he was "making one final attempt to stay alive as a writer", his literary agent arranged meetings with publishers. Benchley would frequently pitch two ideas, a non-fiction book about pirates, and a novel depicting a man-eating shark terrorizing a community. This idea had been developed by Benchley since he had read a news report of a fisherman catching a 4,550 pounds (2,060 kg) great white shark off the coast of Long Island in 1964. The shark novel eventually attracted Doubleday editor Thomas Congdon, who offered Benchley an advance of $1,000 leading to the novelist submitting the first 100 pages. Much of the work had to be rewritten as the publisher was not happy with the initial tone. Benchley worked by winter in his Pennington office, and in the summer in a converted chicken coop in the Wessons' farm in Stonington. The idea was inspired by the several great white sharks caught in the 1960s off Long Island and Block Island by the Montauk charterboat captain Frank Mundus. Jaws was published in 1974 and became a great success, staying on the bestseller list for 44 weeks. Steven Spielberg, who would direct the film version of Jaws, has said that he initially found many of the characters unsympathetic and wanted the shark to win. Book critics such as Michael A. Rogers of Rolling Stone shared the sentiment but the book struck a chord with readers. His second novel, The Deep, is about a honeymooning couple discovering two sunken treasures on the Bermuda reefs — 17th century Spanish gold and a fortune in World War II-era morphine — who are subsequently targeted by a drug syndicate. This 1976 novel is based on Benchley's chance meeting in Bermuda with diver Teddy Tucker while writing a story for National Geographic. Benchley co-wrote the screenplay for the 1977 film release, along with Tracy Keenan Wynn and an uncredited Tom Mankiewicz. Directed by Peter Yates and starring Robert Shaw, Nick Nolte and Jacqueline Bisset, The Deep was a box office success, and one of the top 10 highest-grossing films in the US in 1977, though its box office tally fell well short of Jaws. The Island, published in 1979, was a story of descendants of 17th-century pirates who terrorize pleasure craft in the Caribbean, leading to the Bermuda Triangle mystery. Benchley again wrote the screenplay for the film adaptation. But the film version of The Island, starring Michael Caine and co-starring David Warner, failed at the box office when released in 1980. During the 1980s, Benchley wrote three novels that did not sell as well as his previous works. However, Girl of the Sea of Cortez, a fable influenced by John Steinbeck about man's complicated relationship with the sea, was his best-reviewed book and has attracted a considerable cult following since its publication. Sea of Cortez signposted Benchley's growing interest in ecological issues and anticipated his future role as an impassioned advocate of the importance of protecting the marine environment. Q Clearance, published in 1986, was written from his experience as a staffer in the Johnson White House. Rummies (also known as Lush), which appeared in 1989, is a semi-autobiographical work, loosely inspired by the Benchley family's history of alcohol abuse. While the first half of the novel is a relatively straightforward account of a suburbanite's descent into alcoholic hell, the second part, which takes place at a New Mexico substance abuse clinic, is written as a thriller. He returned to nautical themes in 1991's Beast written about a giant squid threatening Bermuda. Beast was brought to the small screen as a made-for-television film in 1996, under the title The Beast. His next novel, White Shark, was published in 1994. The story of a Nazi-created genetically engineered shark/human hybrid, it failed to achieve popular or critical success. It was also turned into a made-for-television film titled Creature, with Christopher Lehmann-Haupt of the New York Times saying it "looks more like Arnold Schwarzenegger than any fish". Also in 1994, Benchley became the first person to host Discovery Channel's Shark Week. In 1999, the television show Peter Benchley's Amazon was created, about a group of plane crash survivors in the middle of a vast jungle. In the last decade of his career, Benchley wrote non-fiction works about the sea and about sharks advocating their conservation. Among these was his book entitled Shark Trouble, which illustrated how hype and news sensationalism can help undermine the public's need to understand marine ecosystems and the potential negative consequences as humans interact with it. This work, which had editions in 2001 and 2003, was written to help a post-Jaws public to more fully understand "the sea in all its beauty, mystery and power." It details the ways in which man seems to have become more of an aggressor in his relationship with sharks, acting out of ignorance and greed as several of the species become increasingly threatened by overfishing. Benchley was a member of the National Council of Environmental Defense and a spokesman for its Oceans Program: "[T]he shark in an updated Jaws could not be the villain; it would have to be written as the victim; for, worldwide, sharks are much more the oppressed than the oppressors." He was also one of the founding board members of the Bermuda Underwater Exploration Institute (BUEI). Benchley died of pulmonary fibrosis in 2006. In light of Peter Benchley's lifelong record of shark conservation and educating the public about sharks, the Peter Benchley Ocean Awards have been instituted by Wendy Benchley and David Helvarg as his legacy. In 2015 researchers confirmed a new species of lanternshark had been found off the Pacific coast of South America, naming it Etmopterus benchleyi. Lead researcher Vicki Vásquez noted the author's work in promoting ocean conservation, particularly sharks, as motivation. Jaws, 1975 film adaptation; actor: Interviewer. ^ a b Hawtree, Christopher (February 14, 2006). "Peter Benchley". The Guardian. Guardian News and Media Limited. Retrieved February 15, 2011. ^ a b Stratton, Jean (April 2, 2008). "After Nine Years on Borough Council, Wendy Benchley Sets New Agenda". Town Topics. 62 (14). Princeton's Weekly Community. Retrieved May 12, 2018. ^ a b Benchley, Peter (June 4, 2002). "2: Jaws". Shark Life: True Stories About Sharks & the Sea. New York: Random House Publishing Group. pp. 14–19. ISBN 0-307-54574-1. ^ Downie, Robert M. (2008). Block Island History of Photography 1870–1960s (PDF). 2. p. 243. OCLC 428688552. ^ Dowling, Stephen (February 1, 2004). "The book that spawned a monster". BBC News. BBC. Retrieved January 1, 2009. ^ "Rise of the blockbuster". BBC News. BBC. November 16, 2001. Retrieved August 17, 2012. ^ Wood, Robin (June 28, 2002). "Peter Benchley's 'Shark Trouble'". CBS News. CBS Interactive Inc. Retrieved May 12, 2018. ^ Benchley, Peter (June 4, 2002). Shark Trouble: True Stories and Lessons About the Sea. Random House Publishing Group. p. 13. ISBN 9781588362070. ^ Hodgson, Tim (February 17, 2006). "Make your company a world wide known name with us!". The Royal Gazette. Archived from the original on June 5, 2006. Retrieved August 17, 2012. 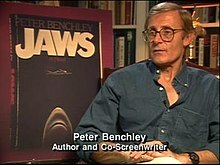 ^ "Jaws author Peter Benchley dies". BBC News. BBC. February 13, 2006. Retrieved August 17, 2012. ^ "About the Awards". Peter Benchley Ocean Awards. Retrieved December 25, 2015. ^ "Forget the Flashlight: New Ninja Shark Species Lights up the Sea". Live Science. Retrieved November 15, 2018. ^ Vásquez, V.E. ; Ebert, D.A. ; Long, D.J. (2015). "Etmopterus benchleyi n. sp., a new lanternshark (Squaliformes: Etmopteridae) from the central eastern Pacific Ocean" (PDF). Journal of the Ocean Science Foundation. 17: 43–45. This page is based on the Wikipedia article Peter Benchley; it is used under the Creative Commons Attribution-ShareAlike 3.0 Unported License (CC-BY-SA). You may redistribute it, verbatim or modified, providing that you comply with the terms of the CC-BY-SA.